The independent Harmony apartments consist of the residences Ariadni, Erofili and Nefeli. 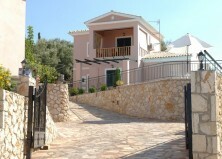 They are situated in a beautiful location, near the town of Lefkada. It is the ideal place for comfortable and relaxing holidays far from the noisy hotels. They are fully equipped residences that can accommodate 2-6 persons, with private pool. Katouna is at a distance of 8 klms from the capital and is situated on the slope of a rich green hill. It is a traditional village where you can have a quiet walk, passing by the stone houses and the narrow alleys, you can visit the Holy Temple of Madonna, the small church of Saint Varvaros and the small church of Saint Paraskevi, on the top of the village with the unique view to the grand blue of the Ionian sea and the Princes’ Island. Yes we are Interest in Lefkada accomodation. I would like to receive information for one apartment with two bathroom or two apartments with cuisine. We are interested in staying at your apartments. Please tell us if you have available room with sea view for two people from 2nd-10th of August. Also, please tell us the price and send us additional photos. Best regards.